Subi, Mischief and Fiery Cross reefs are part of the disputed Spratly Islands, portions of which are claimed by Vietnam, the Philippines, China, Taiwan, Malaysia and Brunei. Subi lies 430 kilometers off the Philippines’ Palawan Island, and 930 kilometers from China’s nearest coastline at Hainan Island. China’s land filling at four other Spratly Reefs – Gaven, Hughes, Cuarteron and Johnson South – has largely ceased, but intensive construction of facilities continues. 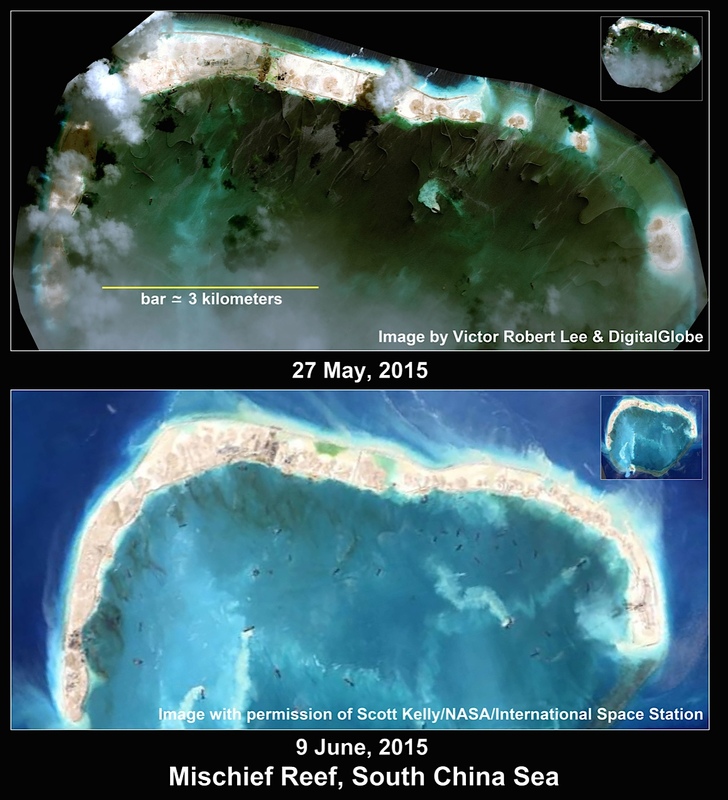 On May 28, the U.S. government reported it had observed two mobile artillery units on one of China’s Spratly installations a month prior, but that they had subsequently been removed or concealed. (According to @Rajfortyseven and the South China Sea Research Forum, the artillery was positioned at Johnson South Reef, also called Chigua.) Each of Gaven, Hughes, Cuarteron, and Johnson South reefs now has a 5-meter by 40-meter concrete ramp leading to a 2nd/3rd story structure connected to a large new building. A ramp-and-“garage” arrangement of these dimensions could accommodate mobile artillery units and permit their concealment as well as provide sheltered elevation above storm surge in the event of a typhoon. Undisclosed by Malaysian authorities, and apparently reported here for the first time, is that a much larger Chinese Coast Guard ship, of the 4,000-ton “3401-class,” has also been operating close to the South Luconia Shoals. 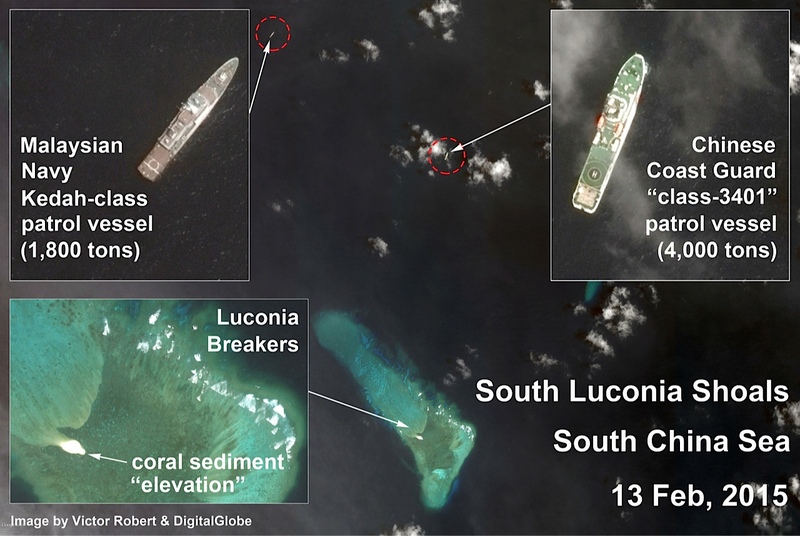 A satellite image from February 13, 2015 shows the Chinese vessel stationed 3.5 kilometers from an elevated coral sediment feature within a site called Luconia Breakers. Because the feature may qualify as above-water, it may be of special value to territorial claimants. Malaysia-controlled pipelines from marine natural gas fields also pass within 30 kilometers of Luconia Breakers. 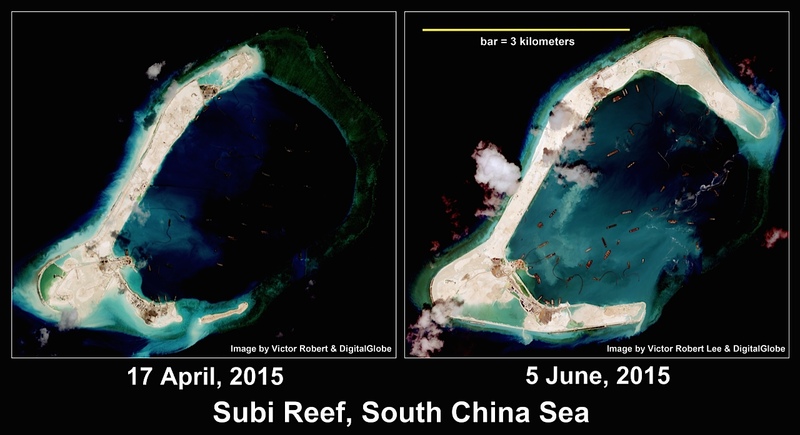 Chinese Coast Guard ships of the same “3401-class” have recently been used by Beijing to wrest control of the Scarborough Shoal from the Philippines, and to blockade the Second Thomas Shoal (also called Ayungin), where a unit of Filipino marines has been stationed. 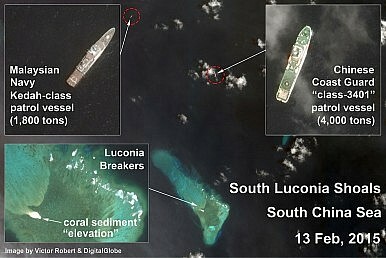 In the February 13, 2015 satellite image, a smaller Malaysian Navy Kedah-class patrol vessel is seen anchored 2.7 kilometers northwest of the Chinese vessel. By not revealing this shadowing of the more threatening Chinese ship, Malaysia may wish to avoid a full-fledged stand-off like the one that resulted in the Philippines losing the Scarborough Shoal in 2012. 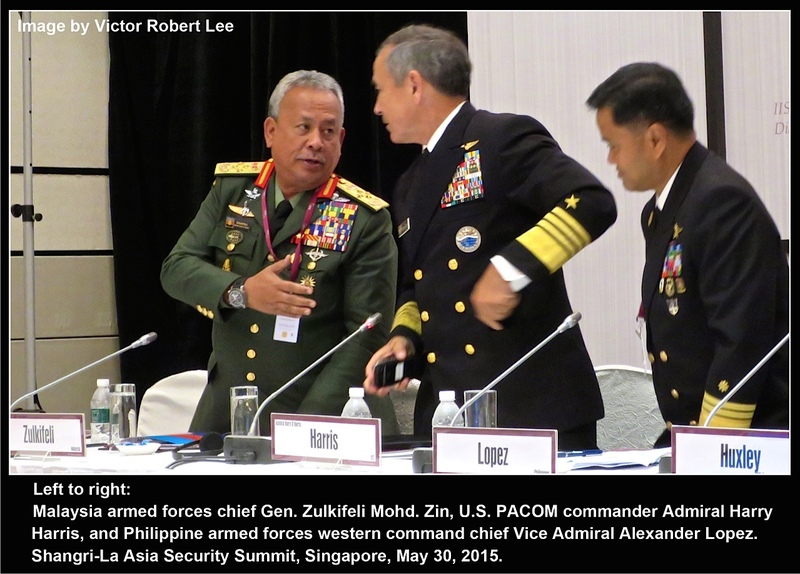 The Malaysian leadership may also be weighing whether over time it can benefit from a counter-balance from the U.S. and its allies. 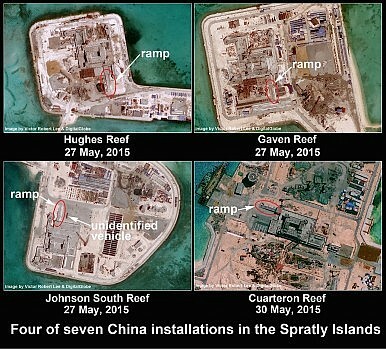 In an era in which the U.S. federal government lacks even the basic competency to protect millions of highly sensitive personnel files from Chinese government hacking, it is unsurprising that Malaysia would proceed cautiously as it assesses the help it might get from America to hold onto territory in the South China Sea. Victor Robert Lee reports from the Asia-Pacific region and is the author of the espionage novel Performance Anomalies. *Corrected from the original 395 acres.